!q <id> - Gets quote with given id. !qadd <text> - Adds the quote. Use | to denote new lines. User \| to escape |. Use \\ to escape \. !qfind <search string> - Searches for a quote and returns the top result. Lists other quotes that match. Tari is thinking of/working on a web frontend. !karma should show the rank of the user also, in addition to the score. 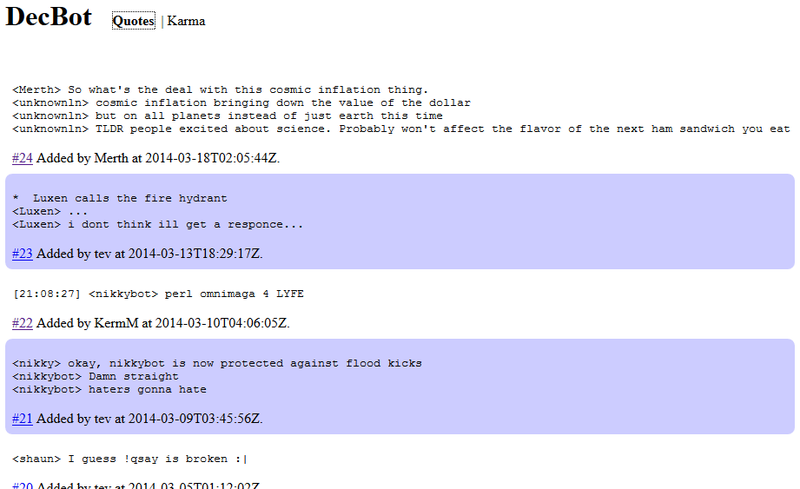 For example, "!karma username" returns "username has a score of 9001 and is ranked #1337." It was proposed as a joke, but I built a web interface for decbot. 2) When a really long name shows up on the table, it stretches out and is covered by the graph. 1) Total score should be displayed somewhere. Ideally at the top, and also include total names. Here's the SQL I use for !total. A similar output would be nice. 2) When I scroll all the way to the bottom it crashed in Firefox. Can't reproduce in Chrome. Too much work to make the styling play nice. It's on my list, but I don't really want to wrestle with layout engines. 1) Total score should be displayed somewhere. Ideally at the top, and also include total names. Could you stick a "word-wrap: break-word" CSS rule in there to force a break midword when needed? 1) Now does tracking of karma changes in the DB. I think Tari plans on doing something with this. 2) Moved what site it spits out to the ini to make changing in the future easier. 3) Added !site to say the site. 4) Removed +v/+o restriction on doing !top. On individual users' pages, it'd be cool if it listed the links associated with that user. This is actually pretty cool. Still reading through the posts. 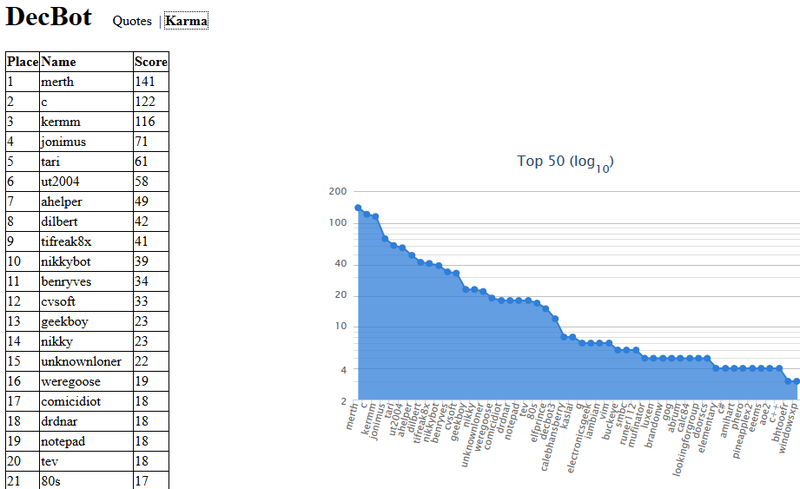 I finished implementing score history graphs today, using the new karma change table. Made it so multiple ++s on the same line get combined into a single entry in the change log. We should maybe go through the DB and consolidate changes from the same time... Oh well. Made other backend changes, too, see bitbucket if you're interested. I imported IRC logs from the end of February up to when we deployed change tracking, so there's more history for some names now. I've updated decbot to use http://is.gd instead of tinyurl. This means no more previews of the pages, and it's a little quicker. See my Bit Bucket if you're interested in the changes. Nothing actually in the decbot repo, just the other API repos. I've added (hopefully) auto-reconnect. We'll see how it does. Well, it went 9 days without going down, so I guess that's good news. In other news, Adriweb found a small bug where I wasn't doing correct bounds checking on the !base command, causing some unexpected behavior. It's been fixed and the code committed. 3) DecBot3 should no longer die when the DB connection dies, it'll just report an error. Code as always is at https://bitbucket.org/merthsoft/decbot. Any chance this could be implemented? It should be pretty simple (in fact, I could probably do it myself, though I'd have to spend some time reading the codebase first, and I haven't really done much C# before) and it might reduce the amount of ~botabuse in IRC. Bug report: incrementing a linked username to your own name doesn't decrement yourself. There are 276 users online: 9 members and 267 guests. Members: GregsAStar, Jeffitus, kg583, Michael2_3B, otzzila, RogerWilco, salehAce. © Copyright 2000-2019 Cemetech & Christopher Mitchell :: Page Execution Time: 0.114697 seconds.